We are in the league of trustworthy firms that are offering Surgical Knives & Blades. 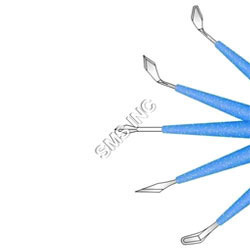 The gamut offered by us includes Ophthalmic Knives & Blades, Lance Tip Blades, Stab Knives & Sideport Blade, Straight/Angled Ophthalmic Knives, MVR Blade & Knife and Ophthalmic Micro Surgical Blade & Surgical Knife. Owing to the features like lightweight, precision engineering, durability and resistance against correction, our offered products are widely applauded by the customers, across the market. In order to help medical experts in their work, we are bringing forth a range of ophthalmic micro surgical blades & surgical knifes. All our products are made using best quality material in accordance with the industry laid norms and guidelines. The offered blades and knifes can be availed by the clients from us at market-leading prices. Our professionals ensure that only defect-free products are delivered at the customers' end with in the promised time. 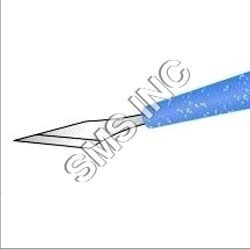 The ophthalmic knives from the house of Shreeji Microsystems Inc are a product of export Quality and reasonable pricing. Composed using the latest state of the art systems, our knives come popular for their accuracy. SMS has been at the forefront of precision inclusion in Ophthalmic Knives very compack & Thinest Knives Success full in world wide Export. 1.2 mm, 1.5 mm, 1.8 mm, 2.0 mm, 2.2 mm, 2.5 mm, 2.75 mm, 2.85 mm, 3.0 mm, 3.2 mm, 3.5 mm 45oangled, full handled high sharp cutting edge. 2.0 mm, 2.2 mm, 2.5 mm, 2.6 mm 45oangled, angled, full handled high sharp cutting edge. 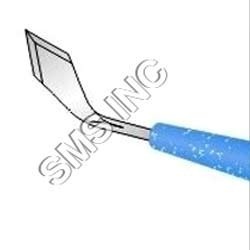 Stab Knives: for side port incision 15degree, 30.0 degree, 45.0 degree, both side hi sharp cuuting edge. Enlarge Knives : for implant knives 5.0 mm, 5.2 mm, 5.5 mm, full handled, 45oangled, both side cutting hi sharp cutting edge. With the aid of our proficient professionals, we have been able to come up with a gamut of Lance Tip Blades, Stab Knives & Sideport Blades. Developed in sync with the norms laid down by the industry, these are widely used in various medical surgeries. Moreover, we offer two varieties of these products like flat strip blade and round wire blade: sharp cut. Our offered products are widely used for used for side port or first scleral incision. We are one of the leading organization engaged in providing excellent quality Slit Knife-Keratome Blade, which are manufactured by using high grade material. These Slit Knife-Keratome Blades are widely appreciated by our clients which are situated all round the nation. High in demand, these Slit Knife-Keratome Blades are available at most reasonable prices. for first entry into anterior chamber Slit-Keratome sharp tip blades. 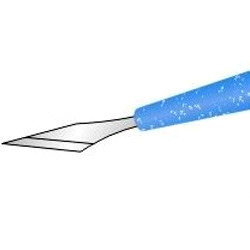 We are offering a wide range of lance tip blades- side port knife to our valuable customers. 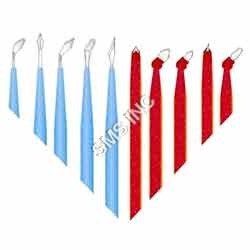 These lance tip blades- side port knife are provided by us at very reasonable price. These lance tip blades- side port knife are highly appreciated by our clients due to its durability. Made available by us is a wide and comprehensive range of Ophthalmic Knives & Blades. These are developed using quality raw material and advanced technologies in compliance with the international medical standards. Clients can avail these knives and blades from us in different sizes and specifications in accordance with their needs. We offer these products to the clients at industry-leading prices. Our enterprise is in the league of leading firms that are offering a range of Straight/Angled Ophthalmic Knives, MVR Blades & Knifes. These are designed and developed by the professionals with precise vitrectomy incisions or ophthalmic incisions. The offered products are both sterile or non sterile as these are manufactured using heavy duty carbon steel or stainless steel. Moreover, to meet the customers' needs, we offer six pieces in a box and at market-leading prices.